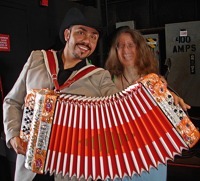 The Los Angeles Times published this article about the increased demand in Nashville for accordions popular with norteño or conjunto musicians, and how that demand parallels increased migration to Nashville. Norteño/conjunto music has been described this way: "Though heavily influenced by German polka, you could say conjunto is the Mexican version of country music--sentimental, nostalgic, pastoral, and often embraced by the working class." The L.A. Times article described the immigrants who have come to Nashville in recent years, and one Nashville councilman was quoted with this reaction: "'[I]t's kind of fun having the different flavors... At the same time, we don't have to lie down and give up our culture and heritage.'"